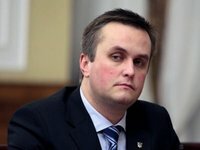 The National Anti-corruption Bureau of Ukraine (NABU) has added electronic communications between persons mentioned in the Bihus.info journalist investigation of corruption in Ukraine's defense industry, Specialized anti-Corruption Prosecutor's Office (SAPO) head Nazar Kholodnytsky has said. "I only yesterday received a letter from the NABU director, who said the bureau had decided to add materials [electronic messages] to the case. They've just decided this," Kholodnytsky said on the Pryamiy TV channel on Thursday. Both SAPO and NABU acknowledge they were in possession of this evidence. "Determining where the materials [electronic messages] were two years ago is the job Ukraine's State Bureau of Investigations (SBI). We have opened a case into the fact of abuse of official positions by NABU officials and transferred these materials to the SBI," he said. "I want to establish the truth. First: why these materials [electronic correspondence] were hidden. I already understand why. Because there was a correspondence of NABU detectives and NABU top officials. And there was a correspondence not only about Ukroboronprom, but also about Ukrzaliznytsia when materials [electronic correspondence] were passed on, so that insignificant information went to court, and significant information that interested the suspects were included [in different proceeding] and quietly died," Kholodnytsky said. The head of SAPO stated earlier that he could not get information from the NABU on corruption in the defense complex, adding that NABU Director Artem Sytnyk was aware of the participation of his subordinates in illegal schemes.